Sometimes making a car insurance claim is inevitable, but we all want to avoid it if we can. Taking a look at the top reasons for claims in 2017, and following these tips, could help you have a claims-free motoring life in 2018. 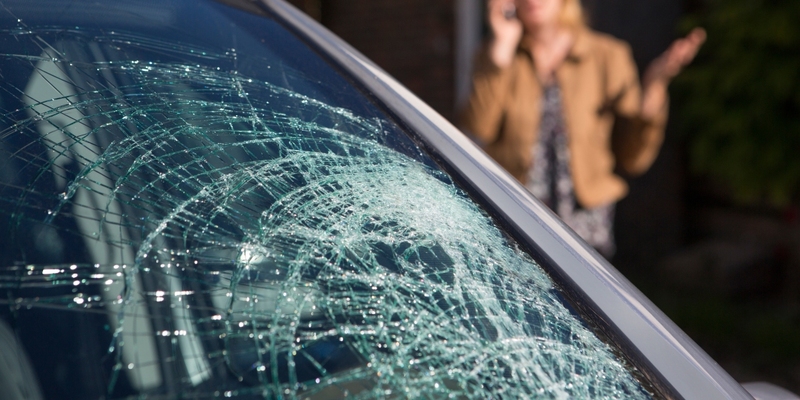 Analysis of claims managed by Ageas in 2017 revealed that one of the most common reasons to claim - representing a third of all car insurance claims - was windscreen and windows damage; either a chip or crack in the glass that needed to be mended, or a complete replacement. Windscreen damage is often caused by driving over a pothole as stone chips from the damaged road fly up and hit the screen. According to the Asphalt Industry Alliance (AIA), which produces an annual survey of the roads in England and Wales, our pothole problem isn't likely to disappear any time soon. Around 1.7 million potholes were filled in 2017, but decades of underfunding have led to around 17% of all local roads being in poor structural condition and the estimated cost of getting them up to scratch is over £12 billion. It can be difficult to avoid potholes without altering your course and potentially affecting other road users. However one useful strategy for minimising windscreen damage is to avoid driving too closely behind lorries, which are particularly prone to throwing up road debris in their wake. Car parking bumps, prangs and scratches gave rise to 15% of known reasons for car insurance claims managed by Ageas during 2017. When it comes to avoiding having your car knocked by a careless driver, one option is to take refuge in a far-flung corner of the car park, where hopefully few other motorists will venture. It'll mean walking further, but at least your pride and joy is more likely to remain unscathed. Another tip is to park next to a new or well-cared for car rather than an old banger. The theory is that they'll want to avoid any bump that could potentially damage their car, which will work out well for you. Do avoid 'Clarkson Parking' however. This phenomenon involves parking across two bays to avoid your car being scratched. The topic went viral in January 2017 when Luke Varley from Doncaster defended parking his Vauxhall Astra in this manner. It resulted in a media outcry with the practice even being described as 'the downfall of society' on Radio 5 Live. When it comes to tracing who might have hit your car, having a dashcam with a 'parking mode' feature can help. These dashcams detect when your car is bumped then automatically switch on and start recording. If you are the shamefaced motorist who has hit a parked car, you must stop at the scene. Try to track down the owner so that you can swap insurance details. If you're not successful, leave your car registration number and contact details under their windscreen wiper. Take pictures of the damage caused and note their registration number, and vehicle make and model. Remember to inform your insurance company about what's happened as soon as possible– any incident which involves damage to property needs to be reported. A rear-end collision prompted 13% of known car insurance claims made with Ageas during 2017. Sometimes a vehicle is hit in the rear as the result of a major road collision like a motorway pile up. But most are going to be the result of tailgating. It's important not to become a tailgater yourself. Even if the motorist in front of you is driving below the speed limit and you think it's safe to go faster, tailgating is only going to make matters worse. The driver may not be very confident and the pressure of being tailgated could make them even more erratic. If you're the one being tailgated, it can be hugely annoying. But don't respond by getting angry, or by deliberately slowing to a crawl to annoy and frustrate them even further (no matter how tempting that might be!). Instead let the driver overtake as soon as you safely can, either by pulling over or even going all the way round a roundabout. Then breathe a sigh of relief and enjoy the rest of your journey.